When you’re considering a kitchen remodel, remember that it’s one of the few places you can really improve your home’s value, if done well. Maybe you need more storage – cabinets, a pantry. Or maybe it’s too dark, too small, needs some repairs or is simply out of date. Has your kitchen ever been updated? Does your kitchen function well for you and your family’s needs? Do you have good storage space? Is your kitchen layout efficient, with bright direct light? Do you have plenty of room for family gatherings, or even for just immediate family to eat together comfortably? Are all your appliances, cabinets and hardware in good shape? Will your kitchen help you in resale value? If you answered no to at least 3 of these questions, it may be time to seriously work on your kitchen remodel project plan. Begin gathering kitchen ideas. Browse the internet, thumb through magazines. It’s a great way to explore kitchen design, décor, layout and finishes. You’ll be better equipped to have a thoughtful meeting with your kitchen remodel project manager or general contractor. Kitchen remodels are a big deal. Anyone who tells you it’s not, hasn’t done one. Choose your kitchen remodeling specialist based on experience, reputation, attention to your needs, taste and style – and your remodeling budget. What shape is the space in today? What products/finishes have you selected (or do you like). Are you remodeling the entire room or just updating cabinets? Are you staying within the room’s current footprint, reconfiguring it, expanding into another area, or adding on to the home? Design your dream kitchen. Choose products and finishes, then determine what the project investment will be. At Star Builders & Remodeling, we work for you. We are sensitive to your time and budget, and offer you our experience to help with great solutions and ideas that fit both. It’s Kitchen Project Kick off Time! Ready to move forward on your kitchen remodel? Similar to our bathroom remodel approach, your first step is a complimentary consultation with our contractor / project manager in your home. You’ll come away with a free project estimate and lots of great preliminary ideas. There may be options available to you that you hadn't even considered! Tour your home. We want to get a feel for your style and the home’s overall flow. Review your kitchen remodel project goals. Your vision is our focus. Discuss initial design ideas and concepts. Discuss project budgeting and timelines. Share a little more about Star Builders & Remodeling’s experience. You decide if the Star Builders & Remodeling team is the right choice for you and your family’s new kitchen. Feeling a little better about a kitchen renovation? Ready to start down the remodeling path? Then let’s schedule a consultation. 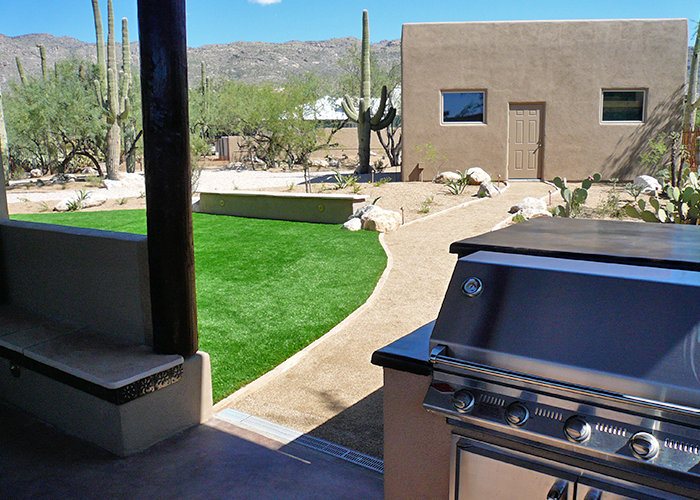 Outdoor kitchens are a popular outdoor cooking option in Southern Arizona. 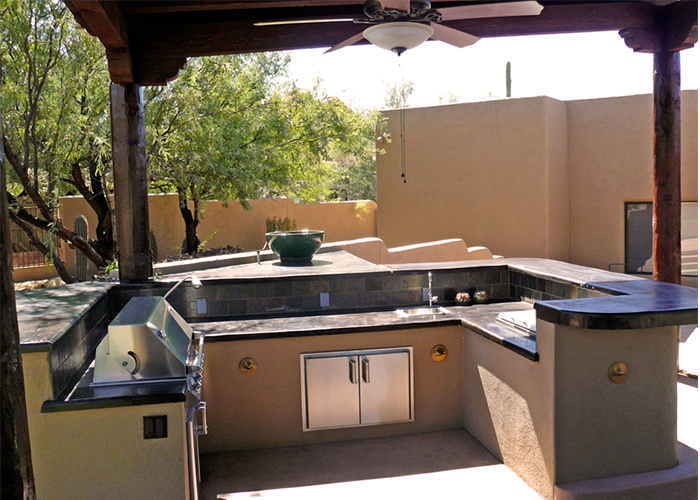 Your outdoor kitchen can be small and efficient, or as elaborate as any gourmet indoor kitchen. You’ll typically see a grill, a counter for prepping and plating food, and a dining counter or table. You may want to add a sink, wet bar, outdoor pizza oven – make it a grill master’s dream! Wouldn’t you like your Southern Arizona home to reflect your family’s personality? Call Tucson’s Star Builders & Remodeling. Family-owned and operated, our professional home remodeling services – whether for a kitchen or bath update, backyard makeover or custom flooring – help you bring your vision to life. As builders and remodeling specialists, we constantly work to raise the bar on our service. Our clients are the key for us to continue learning and improving! Please share your satisfaction with a review. © 2010-2016 Copyright. StarBuilders & Remodeling, LLC. * This statement is solely our subjective opinion and is used purely for advertising and promotional purposes.